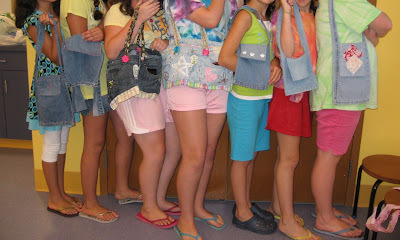 A few of the aprons the girls made for themselves. Denim from old jeans is so durable and versatile. One leg makes a great apron! This is the beginning of a tote bag with pins still in the bottom trim. But check out the yo-yo already attached for decoration! The girls LOVED their yo-yo makers! Here are all the girls, headless of course because I promised their mothers not to show their faces, showing off their bags and purses. 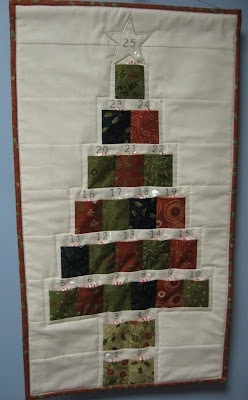 ...and another one that I think will probably get a little more embellishment at home. ...and another one even more dressed up! 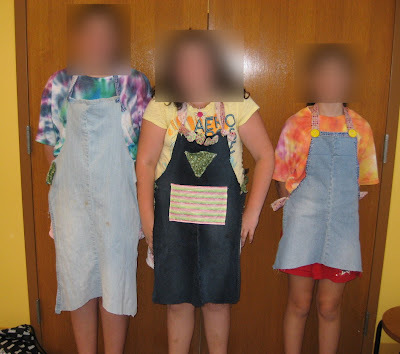 These classes are so much fun to prepare for and teach, and so much fun for the girls who get into them. They are funded by the Friends of the Leominster Public Library and are free to the students. Now that this year's program is finished, it will be interesting to see what we come up with for next year. What a blast the classes must have been! lucky girls to have you as their instructor. Very creative Mary Grace! Love the purses especially the embellished ones. I'm sure the girls appreciated your help during their summer months of fun. What fun - I am sure this is something the girls will always remember. Oh, how darling!! I bet you feel like a proud Mama!! Awwwwwwwwwwwww bless their hearts, I bet those girls had a BLAST at the classes!! Their projects are fantastic! I think that's such an awesome program! I can't wait to see what good ideas you have for next summer! How much fun would that have been. Well done girls. V-A-C-A-T-I-O-N in the summer time! 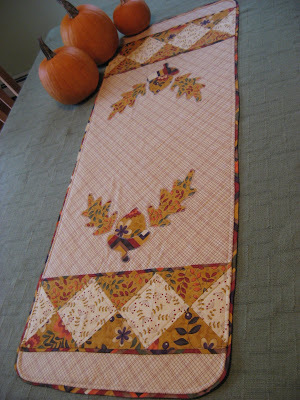 Rip 'n Strip -- my fun, fast method of quilting!